Wow, great choice, this is another one of my favorite easy guitar songs! You will find that learning how to play Wish You Were Here will be really fun, and not as difficult as it seems. It will improve many of your guitar skills, therefore develop you as a guitarist. In the first part of the lesson, you’ll learn the intro riff. Its based on a couple of arpeggiated chords and their alterations, which you probable won’t find that difficult if you’ve been playing guitar for a while. This part of the lesson really improves your fretting hand coordination as well, since you’ll be doing hammer-ons and pull-offs while holding down chords, which is a nice challenge for beginner guitarists, and a must-know guitar technique. In the second part of the lesson, you’ll learn the famous Wish You Were Here solo, which is based on the G major pentatonic scale. You will be using pretty much every lead guitar technique imaginable. 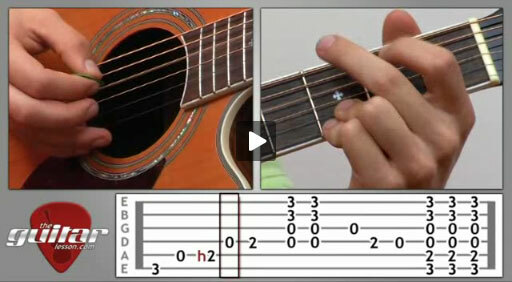 The most challenging elements of the solo are the double string slides, which will take some practice. You’re fingers will burn and hurt from all the sliding, but in the end, you’ll be playing it perfectly, and have taken a huge step in developing your guitar skills. I really recommend that you watch this video lesson and practice this song a lot, since in turn, you’ll be practicing pretty much every important guitar technique. Again, a win-win situation: you’ll be making great music, and practicing your technique at the same time! What more could we ask of life ;-)?! Wish You Were Here was written and recorded by Pink Floyd in 1975, on the album Wish You Were Here. Roger Waters is credited for writing the song, who describes his feelings of alienation from other people, referring to former Pink Floyd member Syd Barrett and his breakdown. If you listen to the original version of the song, you’ll notice that the intro starts off as if it was being played on a bad quality radio. This radio is rumored to be David Gilmour's (lead singer) own car radio. The intro solo is performed on a 12 string guitar, which gives it a very rich sound. The song was covered and performed by many artists, including Radiohead, Pearl Jam, Wycleaf Jean, etc. Sorry, but you've reached a premium content area. The download of the Wish You Were Here tablature file is only available to premium members. Sorry, the same goes for the backing track. To download the backing track to Wish You Were Here, please log in and revisit this page. this video doesnt show the whole song? Hi there, no, this is meant for beginners, so the hard parts are not shown.